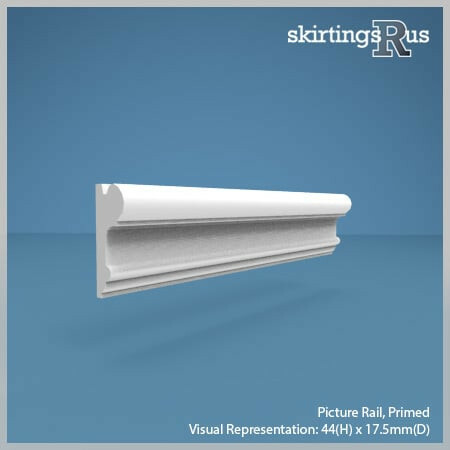 Our picture rail product features a classic picture rail shape, and can be used to add a decorative element within rooms with a high ceiling. It is particularly at home in period properties, in which it would have been used originally. 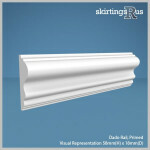 Our picture rail is made of a high density, moisture resistant (MR) MDF. MDF is free from natural defects. This gives it a long product life and means that MDF will not; warp, twist, bow, split, or contain knots, all of which you would find in pine and any other natural wood. This makes MDF the most economical, time saving material for your picture rail requirements. Skirtings R Us MDF builds on these properties. We manufacturer on a High Density MDF board which we have specifically sourced, as it produces a far smoother cut surface when moulded, superior to picture rails made using standard or premium MDF's. Picture rail is only available in one size. Depth – 17.5mm at its thickest. Length – Supplied in 3m and 4.4m lengths. Please allow 100mm on each end of the length for transit damage and cutting. If you need any further help with dimensions please refer to our dado and picture rail dimensions guide. Our picture rail product is only supplied pre-primed. Primed – The rail will be sprayed with two coats of primer and sanded in-between coats. The product will need a final paint finish. For more information on finishes, see our finishes guide. Pre-primed mouldings relieves a lot of work, as MDF, being an absorbent material, can require two or more priming coats to seal it properly. Therefore primed picture rails are the easiest and most flexible product to install with less risk of permanently damaging the finish. We recommend a primed finish on picture rails and would urge anyone who is thinking otherwise to reconsider. Our MDF picture rail is produced in house in our midlands based factory and is machined to order from the specification options above.